Aside from actually lifting the Vince Lombardi trophy as Super Bowl winners, being named the game’s Most Valuable Player is among the greatest honours in American Football. The fact that 23 of the previous 38 retired winners of the award are now securely inducted into the NFL’s Hall of Fame proves just how prestigious becoming a Super Bowl MVP is, and for the players on the Denver Broncos and Seattle Seahawks that dream is ever closer to being realised. As quarterbacks, Peyton Manning and Russell Wilson would be right to think they have a considerable head start on the rest of the field when it comes to getting their hands on the MVP prize. Pigskin slingers have claimed the Americans’ version of the man-of-the-match award an incredible 26 times in the previous 47 runnings of the Super Bowl, including all of the last four, with no other position claiming more than seven titles. It’s therefore easy to see why Manning and Wilson are the leading candidates as far as the betting goes, at 11/10 and 3/1 respectively. However, in line with that famous saying, trends are meant to be broken and one particular player seems built to smash them to smithereens. A losing player has only claimed the Super Bowl MVP award once in it’s history which, as we’ve already pointed out, looks bad news for the Broncos. 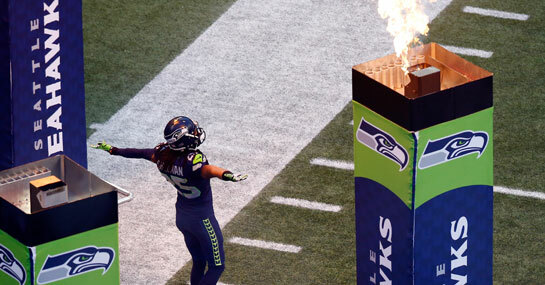 Defensive cornerback Richard Sherman is easily the most charismatic, passionate and recognisable player on the Seahawks roster and can become only the second player in his position to be named MVP, at 33/1. Larry Brown was the first way back in 1996 and did so by claiming two interceptions in the game, both of which led to touchdown’s for his Dallas Cowboys. Considering the Broncos rely heavily on Manning’s passing ability and Sherman led the NFL with eight receptions during the regular season, there are far worse options to stake an MVP buck on.